Elle’s Studio released this week’s Sketch Thursday, and I decided to join in. I hope this layout is not a too wild interpretation of the original layout/sketch! I fell in love with this woodgrain design for the Silhouette, and though to have many 2.5″ circles on my layout, but I should have understood that the original size of the design is what it’s intended for. Let’s just say that I spent quite some time picking flossy cardstock off the cutting mat. The title might seem a bit egoistic, but really… When you think about it: Don’t we all deserve some “me-time”? Products used: Elle’s Studio Everyday Journaling Circle Tags, Elle’s Studio Pennants – Turquoise, white bazzill cardstock, 2.5″ circle punch, Cosmo Cricket Ready-set-chip Heart in the Dark, Pinked Circle design. That was the status this morning. Sadly it didn’t last for long, but I got a photo of it (well, except the humans, but you can’t have it all). Layout made with this sketch from Page Maps. Products used: My Mind’s Eye Good Day Sunshine Daytime Digits B-side, Bazzill Kraft 12×12, Elle’s Studio Everyday Journaling Circle Tags, Elle’s Studio Everyday Large Journaling tags, Elle’s Studio Handmade Layers Date & Place Strips, Crate Paper Emma’s Shoppe Quilts, American Crafts Peachy Keen Neato, Sassafras Lass Mini Alpha Stickers Cool Gray, October Afternoon Mini Market Stickers Cream & Red, Core’dinations Core Impression Woodgrain, The Girl’s Paperie Vintage Whimsy Vintage Buttons. Silhouette Designs: Snapshots title by Jamie Koay, Camera by American Crafts/Amy Tangerine. Tools: Sanding box, Tim Holtz Scissors, Aleen’s glue, Fiskars paper trimmer, Pink ATG, Silhouette SD, Uni-ball Signoe White, Zig 2 Way Glue. Yeah, another blog post from me! Last week husband bought a tent. He’s planning on a motorcycle vacation, but so far the weather has been stopping him from going. He thought it was a good idea to try putting the tent up in the living room before hitting the road. Of course, I documented it all. Layout made using this sketch from Pencillines, and of course, my gorgeous, brand new Silhouette. A layout, a new tool and a GIVE-AWAY! There won’t be a wordless Wednesday from me this week, because I have so much new stuff to write about! Firstly, we got our new washer yesterday. I posted a photo of it on Instagram. Maybe you’re following me and got the news then? It’s really great to have a reliable washer again! We, or I, got something else yesterday as well. This post by Amy Tan pushed me over the edge this weekend and made me order my very own Silhouette. It arrived yesterday and I got a chance to play with it today, making a new layout. This layout is based on this week’s Skissedilla. 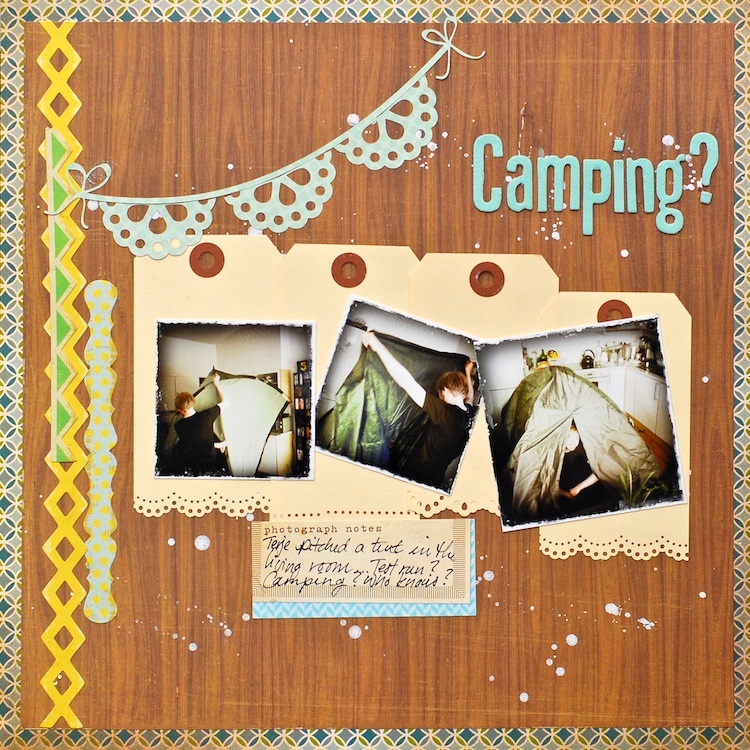 It’s a true clean’n simple layout, using one cardstock, one patterned paper, one mist and two tags. My order from Elle’s Studio arrived today, with just what I needed for this layout. This is the story: My husband is very much hooked on George R. R. Martin’s Song of Ice and Fire series, after waiting for the next book for 5 years, he was looking forward to it arriving in the mail last week. It had been shipped from England on Friday July 8th. Long story short, we ended up getting it twice due to our (my) impatience. Also, I thought I’d make a give-away. I’ve got lots of paper flower. Paper flowers I do not use. Link this give-away on your blog and comment here with a link to your blog for a chance to win! I’ll be sending the flowers pictured in the slide show above, and any else I can find, for free all over the world!